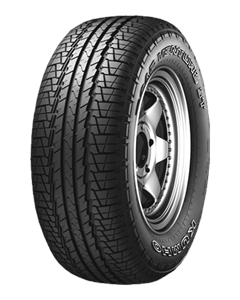 The Kumho KL16 is a road terrain tyre which has been designed to deliver all-season traction, low noise levels and long mileage. This tyre has been specifically designed for use by SUVs and 4x4s whose drivers desire a high level of driving stability and ride comfort yet with a reduced risk of aquaplaning. The tread pattern featured on the KL16 has been manufactured to provide excellent grip whilst accelerating and braking on both wet and dry road surfaces. The design of the tread pattern features an optimised pattern to produce low noise levels for increased driving comfort. Sorry, we currently do not have any tyres with the KL16 pattern in stock.